Whether or not you’ve watched Game of Thrones, you’ve no doubt seen images of Dubrovnik and it’s impressive wall. 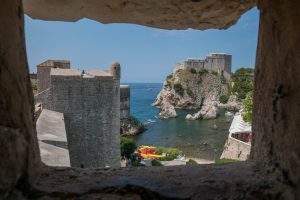 A city contained within a giant, thick beast of a wall set on the beautiful bright blue Adriatic Sea – it’s every bit as magical as it looks in the photos. And even if you’re not actually into Game of Thrones (disclaimer: Ade loves the show, I can take it or leave it) this city is sure to charm you. Yes it’s packed with heaps of tourists (ships coming in here regularly depositing hundreds of extra tourists daily) and everything about the city is geared toward attracting the attention of tourists, but there’s a reason why so many people stop here, it’s beautiful. 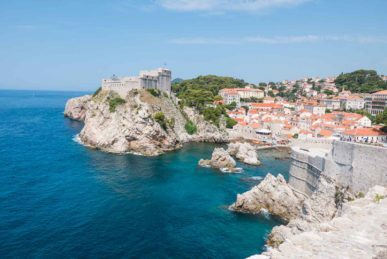 So to help get you started, here are five experiences in Dubrovnik well worth trying – not a Game of Thrones tour in site (unless you include the tour groups you’ll bump into along the way). 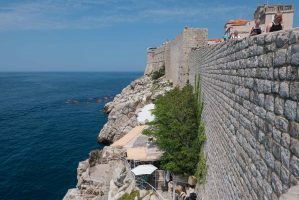 The walls surrounding Dubrovnik are big. Built in the 12-17th century, the walls are considered to be among the most impressive fortifications in the Middle Ages and it’s not hard to see why. 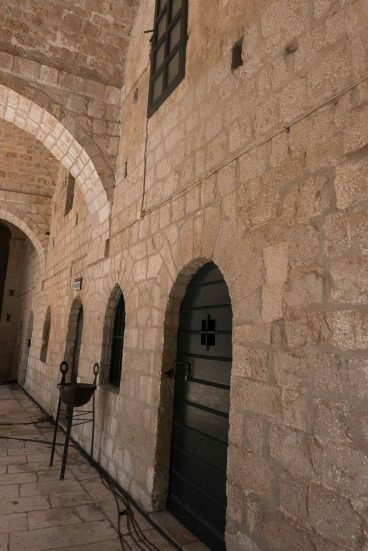 Apparently, not just imposing to look at, the walls were never breached by hostile enemies, so they obviously did their job well! You’ll walk through them when you enter the city, and you’ll get an idea of the foreboding nature of this protective structure. Views from the sentry tower. 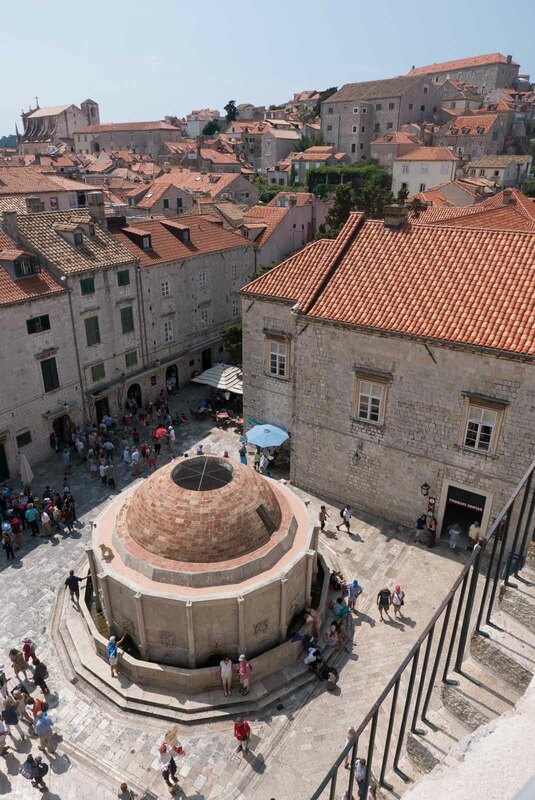 You can save money in Dubrovnik filling up your drink bottle at this water fountain. The width, the mite, the sheer impenetrability of the wall is breathtaking, but if you want to really take in the city and get a sense of the scope of the walls, walk around them. The walls are about 1940 metres long and 25 metres high at the highest point. In some areas, the walls are as thick as 12 metres wide. 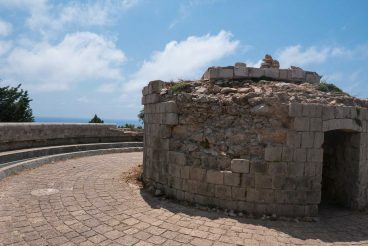 It is an intact, uninterrupted set of walls with various sets of steps up from the town along the way leading to a single walkway across the top. It’s not an easy walk, steep steps at the start, bustling tourists all keen for that perfect shot and searing sun (if you’re there in summer) but it will give you amazing views over the town centre, the sea and the surrounding area. Much of Dubrovnik was damaged from heavy shelling in 1991 in the aftermath of the dismantling of Yugoslavia and from the walls you can see which of the buildings survived, which have been rebuilt and which are still in a state of disrepair. Be sure to stop in at the Minceta Tower and look through the various ‘windows’ and turrets along the way – you’ll never tire of seeing those ocean views. Oh, and don’t worry – there is a café part way along in case you get thirsty! Or, just fill up your water bottle at the free water fountains near Pile Gate. Once you’ve walked the walls and wandered the laneways and boulevards inside the main city, get out onto the water. There are a heap of tour companies offering to take you out in kayaks – you’ll get accosted by tour companies every time you walk through the gates. Pick one, or head to the tourist shop just near Pile Gate to find a program that’s right for you. We went kayaking with one of the local groups, it was awesome. The water really is that azure blue you see in the photos and seeing the limestone walls and fortifications rise up out of the water is quite an imposing site. 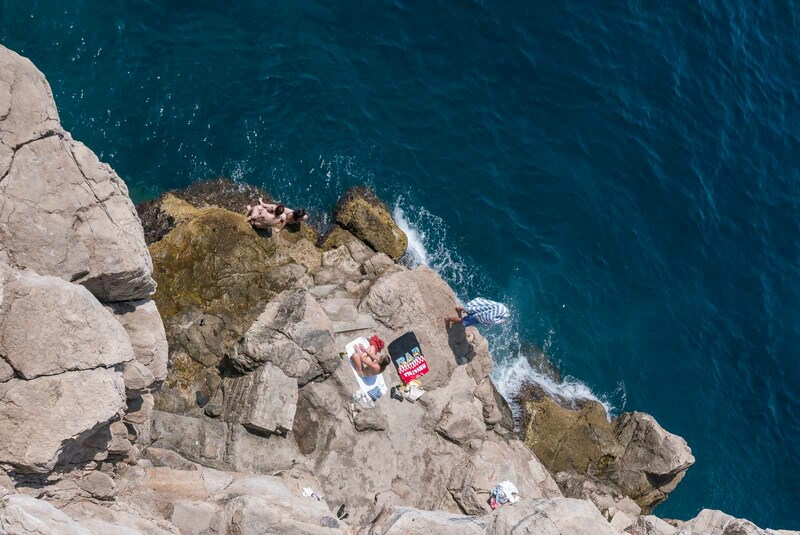 You’ll also get to circumnavigate Lokrum island, swim in a cave (and jump off the walls if you’re brave enough) and of course give your upper body a work out – just to balance out the legwork you’ve been doing with all that walking. There is so much to see inside and on the wall that it would be easy to just stay there, but then, you’ll miss out on so much. The kayaking will give you a taste of what else there is to see and if you look up while out on the water, or down while you’re walking along the wall, you’ll see a quaint little bar nestled just outside the walls, high above the water. The bar is Buza Bar, one of the most famous in Dubrovnik. It will no doubt be packed, but still worth a stop. You’ll need to walk in the direction of the water while inside the walls and then once you hit the wall lining the water’s edge, follow it until you reach a small door. You’ll be ready for a beer when you get there. For amazing views over the old town, head through Ploce Gate, stop and take a look back at this amazing gate and marvel again at the sheer mite of this fortification, then follow the wall around until you get to the main gate Pile Gate. You’ll see the original moat and the full extent of the series of walls that protected the city inside. Marvel over Pile gate for a moment – it’s even more impressive than Ploce and then turn around, with your back to the old city and follow the road until you get to Fort Lovrijenac or St Lawrence’s Fortress. 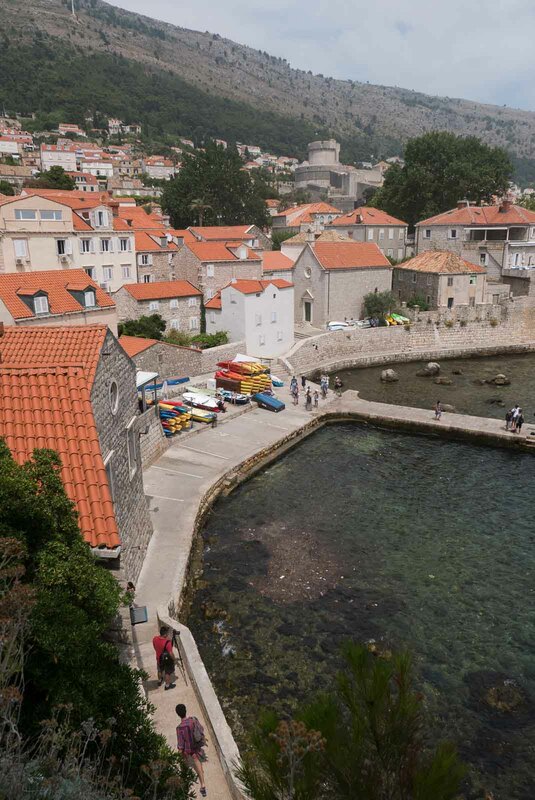 If the town hasn’t already done so, the fortress here will make you feel like you’ve stepped back into the middle ages (you’re likely to bump into a Game of Thrones tour group here). It’s not a big castle so you won’t need long here, but you will get amazing views over the city, the wall, and it’s main gate. No wonder this city appeared in Game of Thrones. 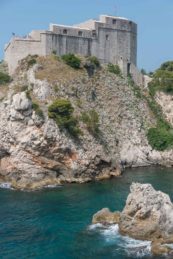 The imposing Fort Lovrijenac, outside the main wall in Dubrovnik. A spot for swimming, outside the wall. Once you’ve seen enough, head back out and make your way to nearby Sulic Beach where you’ll find a couple of bars hugging the cliffs overlooking the beach, including Dodo Bar – a little gem with swings instead of barstools at the bar, guaranteed to bring out the kid in you. 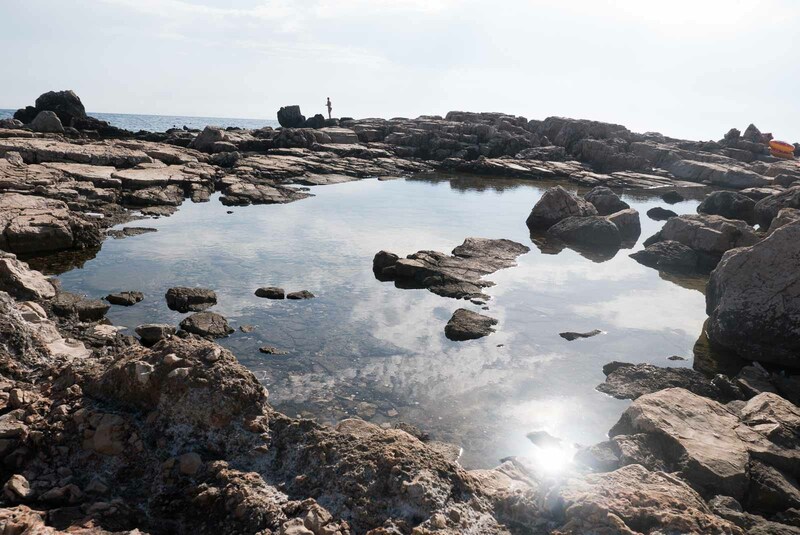 You’ve kayaked around it and no doubt that experience left you with a desire to see more of Lokrum Island, so take the short ferry ride across to the island spend a day wandering over the various ruins, checking out the old monastery and exploring the rock pools. Make sure you take your bathers, there are so many places to swim here and with all the walking, you’ll definitely feel like taking a dip or two around the island. There are cafes, restaurants and bars to keep you watered and fed throughout the day, as well as some wandering lyrebirds to entertain you. Bliss. The rock pools at Lokrum Island, about 600 metres from Dubrovnik. 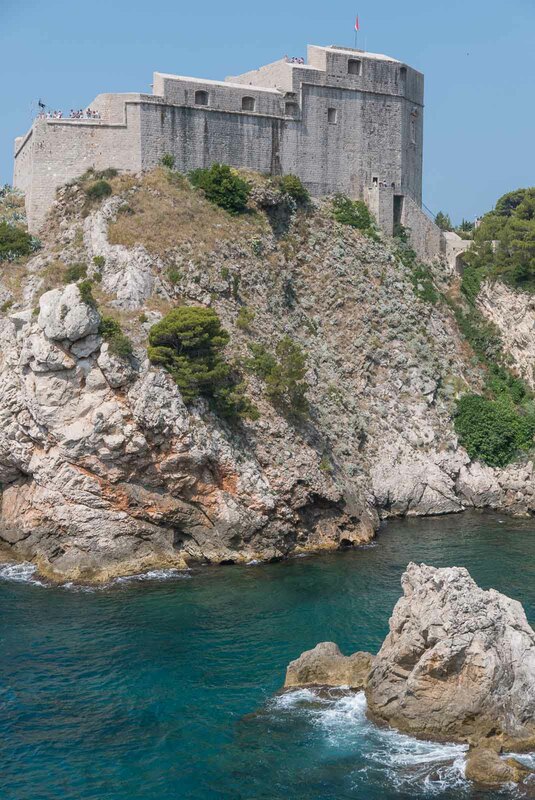 The Fort Royal on Lokrum Island, a 19th century fort with 360 degree views across the Adriatic Sea and Dubrovnik. Ok, we’re from Australia, we expect our beaches to be all white sand and soft grains beneath our feet, so I was surprised to say the least by what passes as a beach in Dubrovnik. Giant rocks or pebbles and concrete paths nestled between the walls and the water. Just find a flat spot and lay out your towel (or sarong). There are generally steps down into the water, or a clear path where the rocks are a little easier to traverse –be careful, they’ll be slippery and who knows what wildlife has made it’s home there! Watch what the locals do and follow in their footsteps. 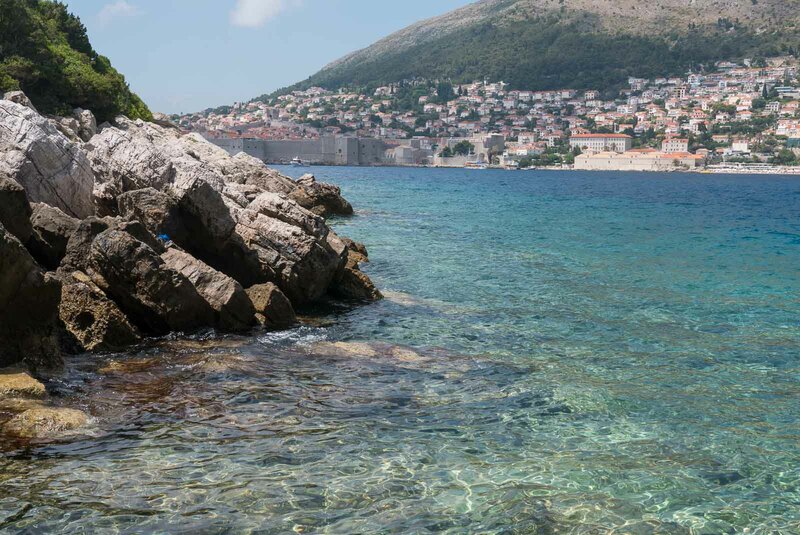 There are beaches all around the main town of Dubrovnik, our favourite was out past the boat terminal and jetty, just follow the wall until you see signs for ‘Beach’. If you’re not sure where to swim, just keep an eye out for a local – you’ll see them swimming just about everywhere! We stayed at an AirBnB just outside the main town. It had amazing views of the town, but was a long steep walk. Was it long enough? 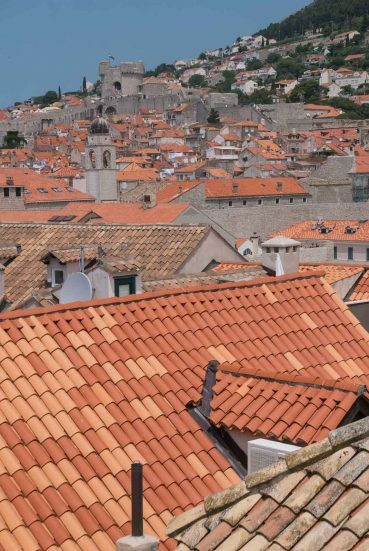 It was the perfect amount of time to explore Dubrovnik, we felt like we really got to explore the town centre and surrounds and immerse ourselves in the city. 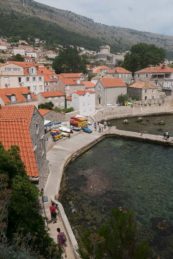 We didn’t get to do any day trips from the town, though there are lots you could do, we preferred to stay and really soak in Dubrovnik. 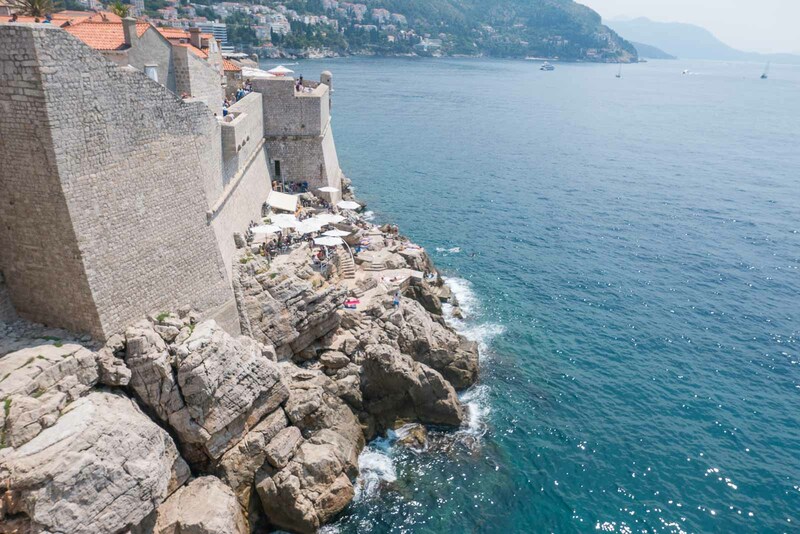 Highlights: Kayaking through the beautiful blue waters, sun downers on our balcony overlooking the beautiful old town, swimming along the walls in that beautiful clear blue water. Been to Croatia? What was our favourite experience? Let us know below. Join AllabroadAu on Instagram, Twitter or Facebook for more travel inspiration.